Most cats have a poised confidence which is exhibited on a daily basis. Now you can portray the same quality you admire in felines with your very own Classy Cat Touch Screen Knit Gloves with Leopard Trim. These jersey knit gloves are not only soft but will keep you warm as well. They feature a leopard printed trim at the back of the cuff. The leopard accent looks chic and fashionable, while still remaining classy. There is reinforced stitching at each side of the animal printed trim for better wear and durability. Better yet, you can use your touch screen devices while wearing these gloves. They have a gold toned panel at the tips of the index finger and thumb. No need to remove your gloves out in the chilly elements. Pair these beautiful gloves with leather riding boots and a cashmere scarf for an overall classic and sophisticated look. The perfect accessory for winter outings, walks, sledding, ice skating, or next time you want to look as classy as a cat. These fashionable gloves are made from 100% Acrylic. They come in sizes S/M and M/L. 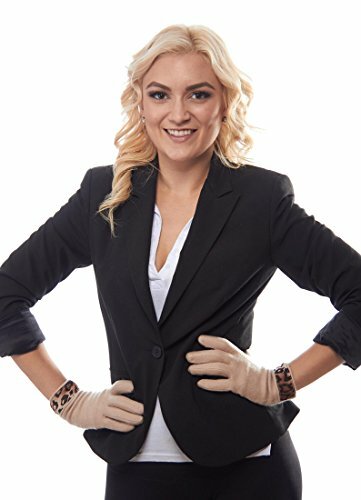 From the tip of the fingers to the edge of the hem, these gloves measure approximately 9.5 inches (24 cm), making them reach just past the wrist on most ladies. This measurement was taken from a size M/L. These chic gloves are available in many lovely colors including dark brown, ivory, and charcoal gray. To clean simply hand wash and lay flat to dry. If you have any questions about this product by Greatlookz, contact us by completing and submitting the form below. If you are looking for a specif part number, please include it with your message.